and right before it went to press (which sold out the first printing!?! 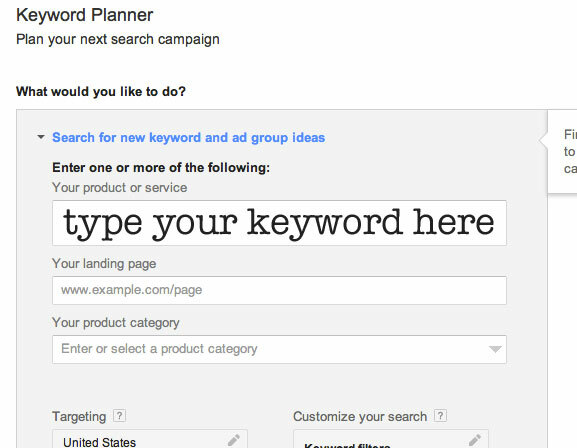 ), Google made changes to their Adwords Keyword Tool. Although it’s pretty similar to before, it was hard to write about these changes because it was so new there was relatively little information about it out there. Now that I’ve had a few months to use it, and I’ve gotten tons of emails about it, I thought it was time to finally write a blog post about how to use it. I know this information will only be pertain to bloggers, Etsy sellers, or anyone who runs a website of some kind. I know (because so many of you were so awesome to take my reader survey) that you come here for DIY/decorating & all things home related. So those who don’t need the info bear with me, and tomorrow we’ll talk about rugs or lamps or something. Start by going to the website: Adwords.Google.com. You’ll need a Google account (and you probably already have one) so log in to get started. Once you’re logged in, this is the screen you will come to. Up at the top of the dashboard, you’ll see “TOOLS” – click there to open up a drop down menu. 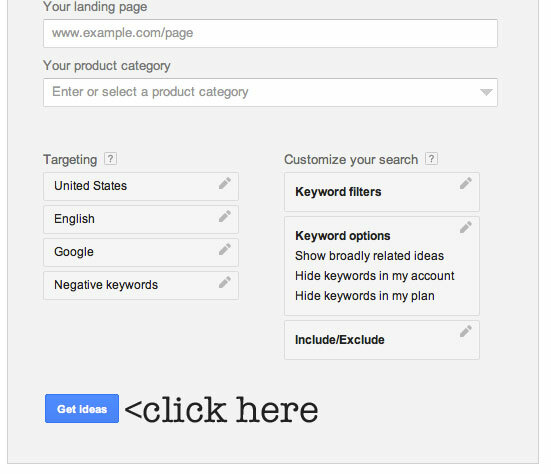 From the drop down menu, select “KEYWORD PLANNER”. When the tool comes up, type the keywords you’d like to search in the first box under “YOUR PRODUCT OR SERVICE”. Be as to the point as possible. If you are searching for the search stats on table runners, then use “table runners” as your keyword. If you’re not exactly sure, then ask your friends/spouse/someone else to see what words they’d use to find the product/information. When your words are typed in, scroll down just a bit until you get to the bottom of the box, where you’ll see the words “GET IDEAS” – click on it to open up the results. When the results are displayed, you’ll see two tabs – to get to the best results you’ll need to click on “KEYWORD IDEAS” which is not the default setting. After the Adwords Keyword Tool page opens, you’ll see a huge list of keywords. The results will be almost overwhelming, but you’re looking for two main things: a high number of Avg. 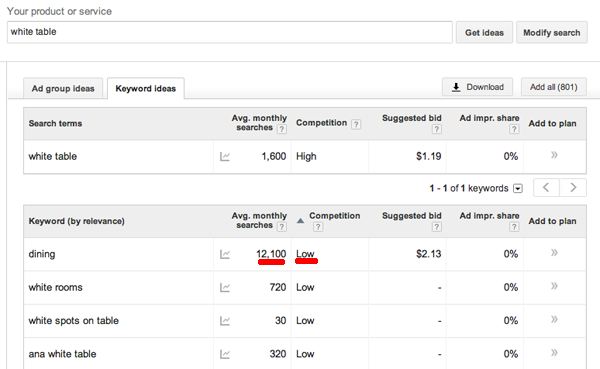 Monthly Searches plus a low Competition rate. You can click the words on the categories to sort the results by those criteria. Average Monthly Searches means how many times people “Google” that term within a month. Competition means how often those words are used online. High means theres a TON of folks using those keywords and your chances of being seen are kinda slim. If you choose a Low rate, your chances of being found in a search engine (whether it’s Google or Etsy) are much higher, because you don’t have as many websites to compete with. If you can find keywords with over 5,000 searches and a low competition rate – you’re in good shape. If you find ones with over 50,000 searches and low competition – you’re in GOLDEN territory. The hardest part of the whole process is to try every single combination of words you can think of to describe what you’re offering (whether it’s the name of a product or the subject of a blog post.) Either way, using this tool will help you to understand. Just keep trying, you’ll eventually find the best choice for you. I am really glad you took a day away from talking about rugs, decorative items and photos to share this information. As I just set a goal to create my own Etsy this year. I gotta get my hands on your book. Have a super day! Look forward to whatever amazing and creative post you share tomorrow. First – I LOVED your book and devoured it! My goal is to sell enough that I make so that I can actually retire at some point and support myself. Second – this is such great information! My second goal is to drag folks (kicking and screaming if necessary) to my site. Thanks so much for a wonderful post!! Thank you for this information. It was very helpful. Right off the bat I found a search term with 673,000 searches and low competition. I wouldn’t have known what to look for or what it meant without your help. Thanks again. Thank you Gina! You are hands-down my Etsy guru! Looks like I need your book! I have reserved a shop name on Etsy and that’s about it. I need get it designed and all the marketing stuff that goes with that, and start listing stuff. I have a TON of stuff I need to list, and it’s all sitting around in my house, creating quite a mess! Thank you for this post! Great post ! I am always excited to see bloggers learning and using best practices for SEM/SEO. Right now you can sign up for a Google AdWords account and use Keyword Planner while not putting any money into a campaign. That will be changing this year. According to various PPC blogs and Adwords blog they have no tentative on the change date so for now, use it !!!! I am sure they will release a free tool in Google Analytics to help with that shift. I try to remember to use Google Adwords when I write a post, but it can be overwhelming and confusing. I pinned this so I can refer to it and do a better job at it. I plan on an Etsy shop, or something similar, in the near future so hopefully this will help with that. Thanks for the post! I am going to do this for my next post. Thank you!!! The keyword planner has been very helpful for us to grow our software business. Also by default it shows broad matches as well. For most keywords this data could be a bit overwhelming, especially if you’re just starting out. So better to select only closely related keywords. 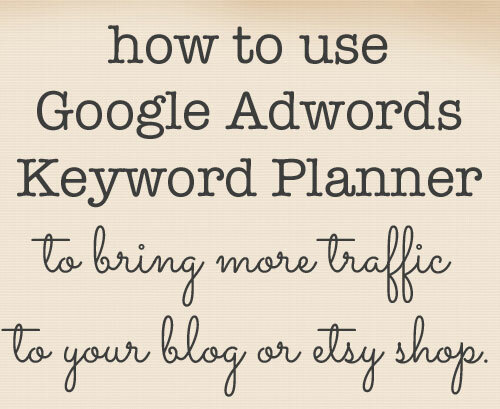 I was using adwords keyword planner from a long time. But after reading your whole post, I got to know about I was doing everything wrong. You are write, we have to choose keyword whose competition is low. Earlier I was choosing keywords of high competition. Thank you for much needed informative post on selecting keywords.